CHATTANOOGA, Tenn., Dec. 2, 2016 - Grammy-winning musician Vince Gill has been named an ambassador for Songbirds Guitar Museum, the world's largest private collection of rare, vintage guitars. The museum will open to the public in early 2017. Located next to the Chattanooga Choo Choo, the museum is a guitar-oriented, pop culture experience for the whole family. A Grand Opening Celebration will take place on March 9. Gill, a member of the Country Music Hall of Fame, will showcase his top-notch songwriting, world-class guitar playing, and soaring tenor vocals at the Grand Opening Celebration. In addition, he will lend his voice and expertise to Songbirds Guitar Museum as it shares its unparalleled collection through its permanent and rotating historical exhibits. "This is the most impressive collection of rare, vintage guitars I have seen," says Gill, who will curate some of the exhibits. "I am honored and excited to be a part of such a tremendous display of music history." "We are incredibly excited to have Vince Gill join the Songbirds team. His connection as a guitar player and his talent as a performer make him a perfect spokesman to help us share our epic collection of guitars with music lovers everywhere," explains Johnny Smith, President of Songbirds Guitar Museum. 34 Gibson Les Paul Model Sunbursts from 1958-1960. Some of the most expensive of their kind. Considered by many to be the Holy Grail of electric guitars. Over 300 custom color Fender guitars– a rainbow of color. Many of these are one-of-a-kind. Over 75 custom color Gibson Firebird guitars– even more scarce than the Fender custom colors. Over 45 classic "Bluegrass" flattops, flathead original five string banjos, mandolins, and the like representing the best of Martin, Gibson and other manufacturers. In addition, Songbirds Guitar Museum will host a contest to give away tickets to the private, VIP Grand Opening Celebration. Contest details will be available in January. The Museum boasts a complete collection of over 1,700 instruments and accessories, each with a story to tell. Guitars are grouped by brand, time frame, and linear progression and include acoustic, electric, jazz, bass, mandolin, banjo, and mandocello models. Songbirds Guitar Museum is historically accurate, educational and fun for guitar enthusiasts as well as newcomers to the world of fretted instruments. The 7500-square-foot museum features interactive, educational displays for adults and children, an upgraded All Access tour, and an event space for private parties. Songbirds Guitar Museum is located at 35 Station Street on the grounds of the Chattanooga Choo Choo in Chattanooga, Tennessee. About Songbirds GuitarsSongbirds Guitars is a guitar-oriented, pop culture museum experience for the whole family. Explore our collection of rare, vintage guitars like no other on Earth. Experience American history through Songbirds Guitars extensive anthology of permanent and revolving exhibits on the campus of the world-famous Chattanooga Choo Choo. Immerse yourself in a musical history of America in a new and unique environment. Learn more at www.songbirdsguitars.com. 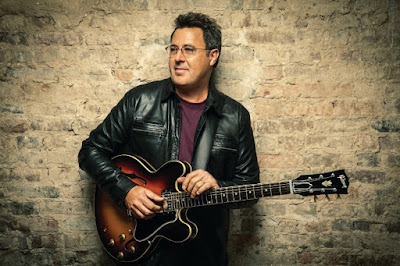 About Vince GillOne of the most popular singers in modern country music, Vince Gill is famous for his top-notch songwriting, world-class guitar playing and warm, soaring tenor, all wrapped up in a quick and easy wit. Gill achieved his big breakthrough in 1990 with "When I Call Your Name," which won both the Country Music Association's Single and Song of the Year awards as well as a Grammy. Gill has won 18 CMA Awards, including Song of the Year four times – making him the most-awarded artist in that category in CMA history. Since 1990, Gill has won 20 GRAMMY Awards. A wide-ranging songwriter, his compositions earned him entry into the Nashville Songwriters Hall of Fame in 2005. The Academy of Country Music has conferred on Gill eight awards, including its prestigious Home Depot Humanitarian Award and the 2011 Career Achievement Award. Gill was inducted into the Country Music Hall of Fame in 2007. He is also a member of the Grand Ole Opry. In August 2012, Gill was honored with a star on the Hollywood Walk of Fame. He is a member of the four-time Grammy-nominated band The Time Jumpers. Gill has produced albums for LeAnn Rimes, Amy Grant and Ashley Monroe and has made guest appearances on more than 500 albums including on those by Barbra Streisand, Eric Clapton, Willie Nelson, Dolly Parton, George Jones and others. Gill's latest album is Down To My Last Bad Habit. For a full list of tour dates, news, images and more, visit www.VinceGill.com.